A face mask is a wonderful way to pamper and nourish your beautiful face. 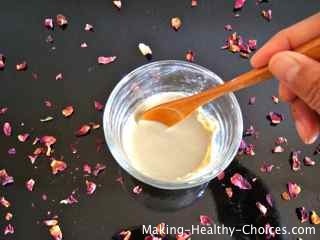 Making your own home made face mask is easy to do and by making it yourself you will be assured that the ingredients you use will be healthy for your face. Click here to read more about the importance of only putting healthy ingredients on your body. 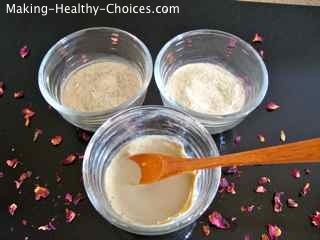 Many homemade face mask recipes can be made with simple ingredients found in your kitchen or around your home. Simple ideas that are less expensive, work better and are much more healthy than many store bought or salon masks. 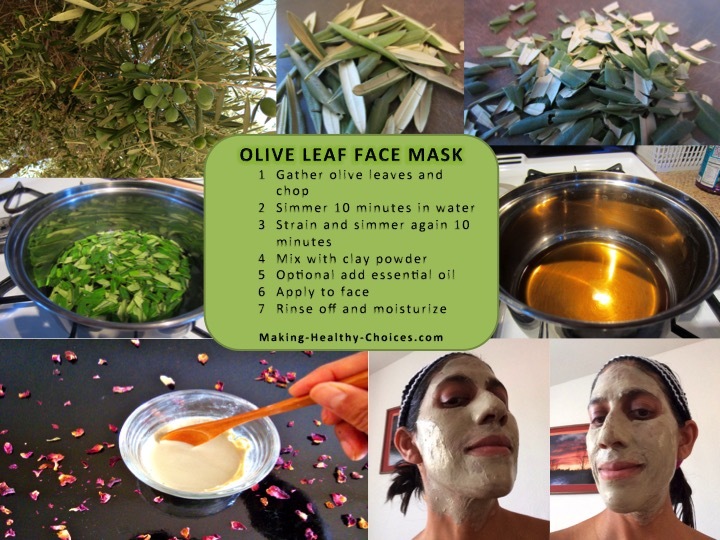 Natural face masks like the ones I will show you here are perfect for both men and women. I would suggest doing a mask once per week. Apply masks to the face and neck areas while avoiding the skin around the eyes. 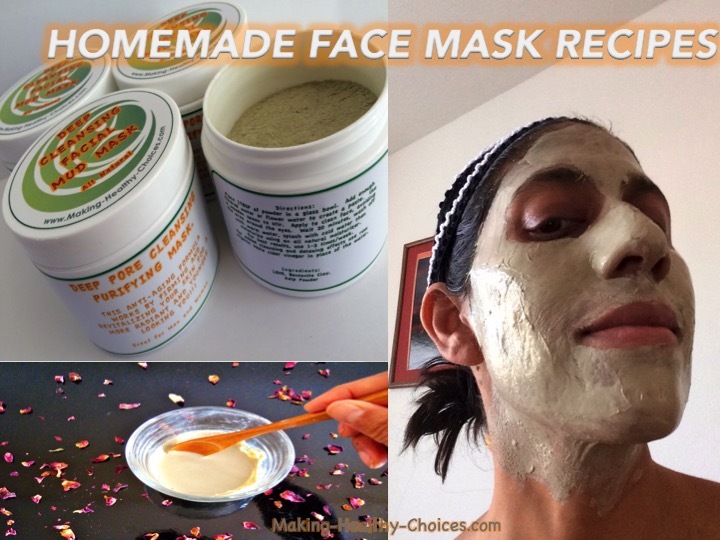 There are many nourishing (and fun) homemade face mask recipe ideas. As this site grows I will continue to add to this list. Continue to check back or subcribe to this site to know when new recipe ideas have been added. For best results always use organic ingredients and make your recipes with LOVE - this is the secret ingredient that make all recipes shine. Mix clay powder and water (or hydrosol) in a wooden or glass bowl. Mix with a wooden spoon. Do not use metal or plastic as these can leach toxins into your mask. Mix clay powder together with enough water to make a thin paste. Always store your clay powder dry and only make enough paste to use each time you are doing a mask. 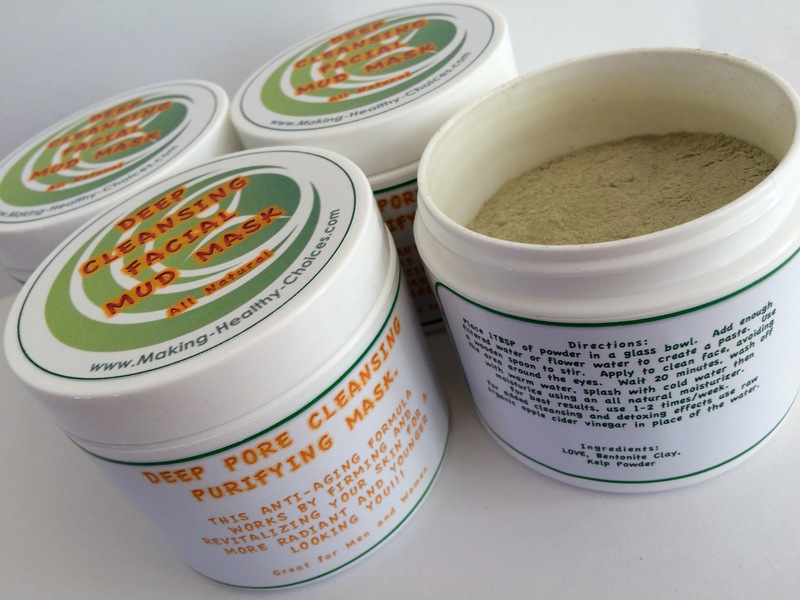 Bentonite Clay and clays, in general, have been used since ancient times to cleanse and nourish the skin. Clay has the amazing ability to draw toxins out and can hold many times its weight in toxic matter. Clay also has anti-inflammatory properties, is very cleansing and improves circulation. Obtain only dry clay and mix with water at time of use. To learn more and/or to purchase bentonite clay, click here. This takes the above basic clay recipe to the next level by adding the extremely beneficial properties of seaweed into the mix. 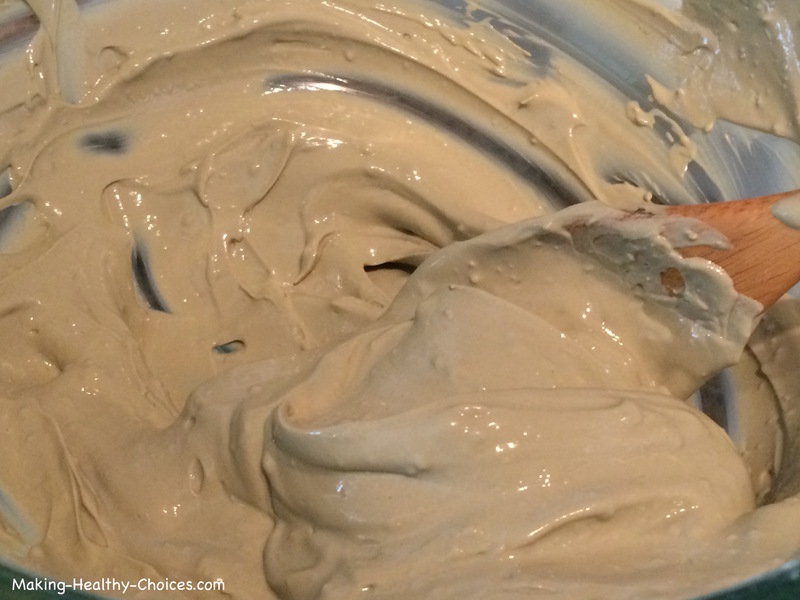 Mix the dry clay and kelp powders together and store in a glass jar. When ready to use, blend dry powder mix together with enough warm water to make a thin paste. Use a wooden or glass bowl and a wooden spoon for mixing as plastic or metal may leech toxins into your mask. Spread on face and leave for about 20 minutes. Rinse off with warm water, pat dry, mist face with a toner and moisturize with a clean moisturizer (coconut oil is nice for this). Kelp is a wonderful seaweed that is extremely detoxifying and nourishing and is known for its anti-aging properties. Kelp will leave your skin feeling revitalized and glowing. To learn more and/or to purchase kelp, click here. Thanks to James Wong for the inspiration for this recipe! 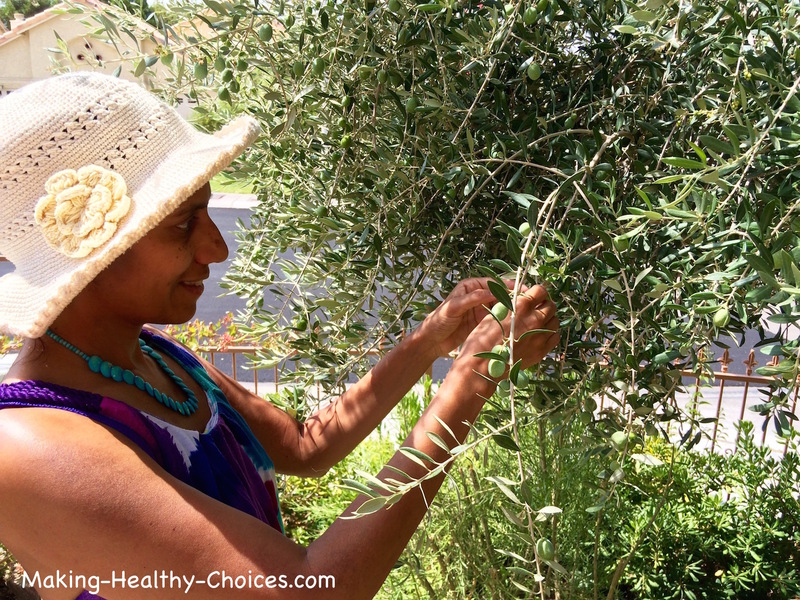 We gathered the olive leaves for this recipe from olive trees growing right in our neighbourhood. Place chopped olive leaves and water in pot and simmer for 10 minutes. Strain out plant material and return liquid to stove, simmer for another 10 minutes to reduce. Put a small amount of clay powder in a glass bowl (start with about 1 Tablespoon and you may need to add up to 4 Tablespoons) and slowly add liquid and clay until you get a nice mud consistency. Optionally, you can add a few drops of lemongrass essential oil (or essential oil of your choice but avoid using citrus oils as they can be phototoxic) which will add a beautiful fragrance and help this product to keep. Store remainder of your homemade face mask in a glass jar in the fridge. 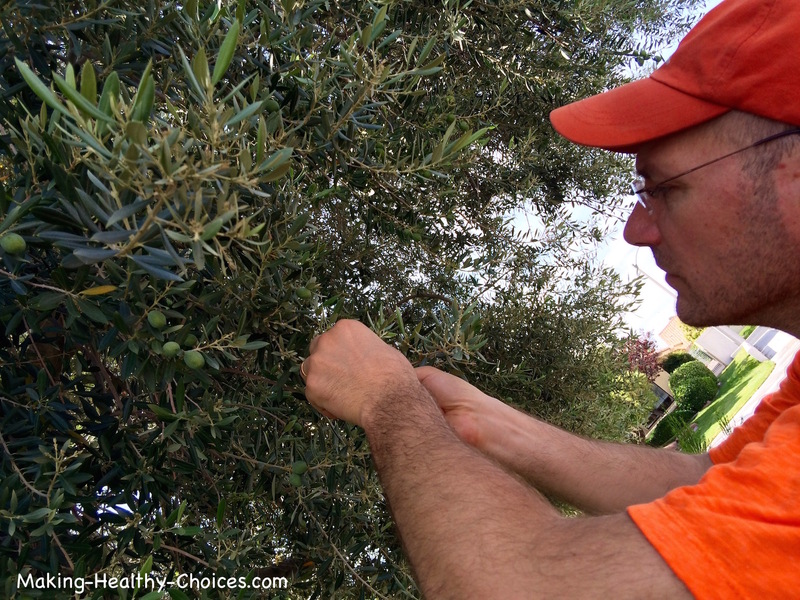 Olive Leaves are full of antioxidants which is great to combat the effects of aging. Also wonderful to protect your skin against the effects of artificial heating or air conditioning, pollution and harsh weather conditions. Leave on for at least 10 minutes before rinsing. After rinsing off the avocado face mask you will probably find that you don't require any additional moisturizing. The oils from the avocado will have penetrated into your skin leaving you with a beautiful and healthy glow. Avocado is extremely moisturizing making it a wonderful mask for dry or more mature skin (or for dry scalp conditions such as dandruff). Avocado has antioxidant properties making it very nourishing and protecting for your skin ... Natural sunscreen the way Nature intended it! I hope you enjoy these homemade face mask recipes as much as I do! Do face masks once or twice a week and remember that the best way to glowing healthy skin is to combine natural organic skin care with things like eating healthy, drinking enough water, living stress free, getting plenty of movement and laughing a lot. Enjoy... You are worth it!! !